iNotes Web Access is a next-generation Web client that allows you to utilize the most popular Domino functionality with a Web browser. You can work on your mail, use your calendar for personal and group scheduling, and do some advanced task management. In addition, you have access to your contact information and a journal-like notebook. iNotes Web Access also has a customizable Welcome page. 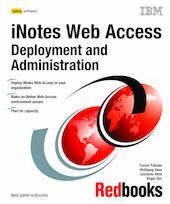 This IBM Redbooks publication offers you information on how to best install, deploy, and configure iNotes Web Access for your environment. It describes how to make your installation secure, keeping unwanted visitors outside of your iNotes Web Access installation yet allowing your users to access their mail files from outside the corporate firewall. If your organization uses Notes clients to access mail and other services of Domino, you will still find iNotes Web Access useful. A scenario where these clients coexist is explained, and upgrading to such an environment is described in detail. All the functionality of iNotes Web Access is available for you online as well as offline. How to enable offline access to iNotes Web Access with Domino Off-Line Services is presented. This book gives you details for capacity planning so you can size your environment correctly and describes how to get the best performance out of your servers. It also gives you information on how to integrate Lotus Sametime into your iNotes Web Access environment. We describe the architecture of iNotes Web Access and, finally, offer some examples of how to make modifications to iNotes Web Access.